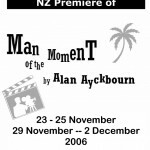 An Alan Ayckbourn play, “Man of the Moment”, never before performed in New Zealand, will premiere in Eastbourne at the end of November, produced by Butterfly Creek Theatre Troupe. “Man of the Moment” won a London award for Best Comedy 1990. 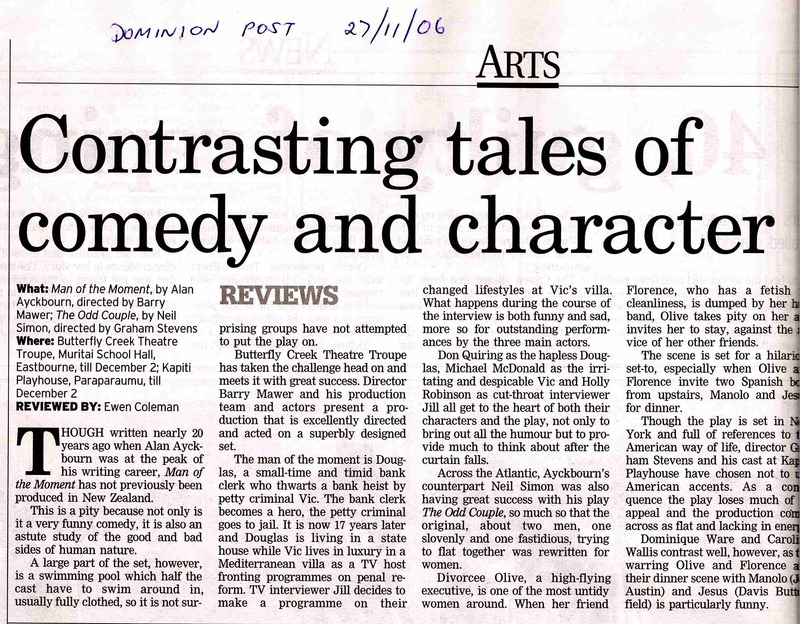 “It is Ayckbourn at his best”, says director Barry Mawer. “It is not only very funny but, typical of Ayckbourn – it also has something to say.” As with other productions by the troupe, the play has its technical challenges. “We had a stage direction ‘exit, chased by a bear’, in Shakespeare’s Winter’s Tale. This time it’s ‘enter Vic swimming’.” A swimming pool will be erected on stage but Barry assures us that the front row won’t get wet.Alan Ayckbourn’s inspiration of the play came when he used to pass the flower stall run by the Great Train Robber, Buster Edwards, on his way to work at London’s National Theatre. The criminal’s life was at that time being recorded in the movie “Buster”, starring Phil Collins, and his poster was all over London. Alan was intrigued how the criminal had become a celebrity through media manipulation when no one remembered the train driver who died as a result of the robbery. The resulting play explores good and bad sides of moral character, epitomised by these two personalities. 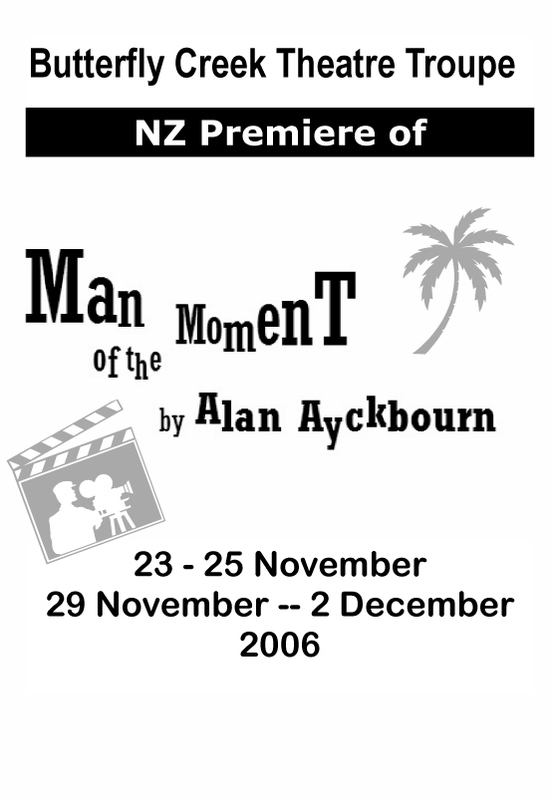 Though written nearly 20 years ago when Alan Aykbourn was at the peak of his writing career, Man of the Moment has not previously been produced in New Zealand. This is partly because not only is it a very funny comedy, it is also an astute study of the good and bad side of human nature. A large part of the set, however, is a swimming pool which half the cast have to swim around in, usually fully clothed, so it is not surprising groups have not attempted to put the play on. Butterfly Creek Theatre Troupe has taken the challenge head on and meets it with great success. Director Barry Mawer and his production team and actors present a production that is excellently directed and acted on a superbly designed set.The man of the moment is Douglas, a small-time and timid bank clerk who thwarts a bank heist by petty criminal Vic. The bank clerk becomes a hero, the petty criminal goes to jail. It is now 17 years later and Douglas is living in a state house while Vic lives in luxury in a Mediterranean villa as a TV host fronting programmes on penal reform. TV interviewer Jill decides to make a programme on their changed lifestyles at Vic’s villa. What happens during the course of the interview is both funny and sad, more so for outstanding performances by the three main actors. Don Quiring as the hapless Douglas, Michael McDonald as the irritating and despicable Vic and Holly Robinson as the cut-throat interviewer Jill all get to the heart of the play, not only to bring out the humour but to provide much to think about after the curtain falls. Good and evil confront each other with hilarious results in Man of the Moment, the Alan Ayckbourn hit currently being staged by Butterfly Creek Theatre Group. But don’t think it is a hard watch. It’s a fast paced British comedy dealing with the public perception of heroes and villains and how the truth can be twisted and that perception altered. The play revolves around two men, former bank robber Vic Parkes and former bank teller Douglas Beechey, chosen to meet again after 17 years for TV programme Their Paths Crossed. Presented by cutthroat TV host Jill Rillington, played to perfection by seasoned performer Holly Robinson, the show is to be shot at the Parkes’ sumptuous Spanish Mediterranean villa. Parkes, an urbane yet cruel, overbearing and self-indulgent individual, is played to the hilt by Michael McDonald, and Beechey, a thoroughly decent man who had quietly got on with the remnants of his life, is beautifully brought to life by the talent of Don Quiring.Supporting characters Anne Manchester as Vic’s long-suffering wife Trudy, and Will Clannachan as his manager Kenny Collins are well cast and entirely at home in their roles, with Clanachan worth watching clo0sely for his ability to convey nuances of emotion with subtle changes in posture. Watch out also for laugh-out-aloud performance from Peter Hughson as Ruy the defeated gardener, and Sarah-Rose Burke as the downtrodden nanny. 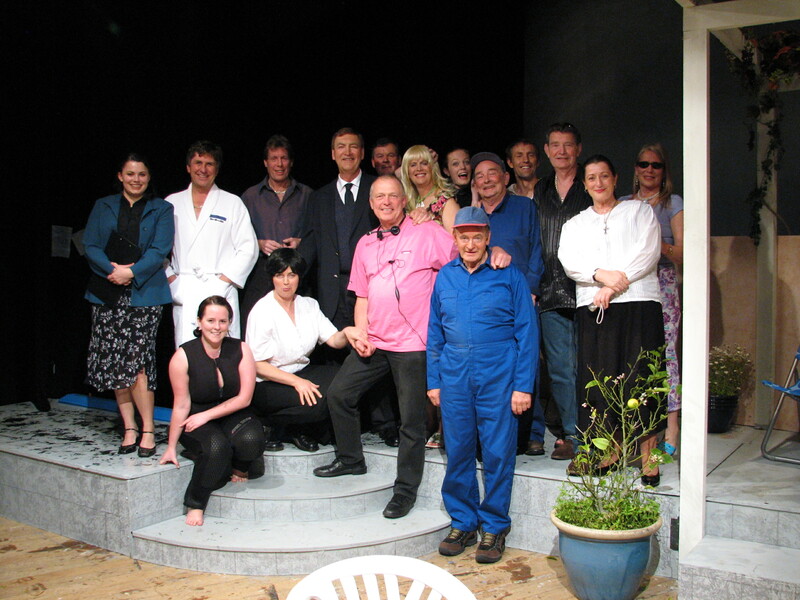 The first aspect of this play to impress is the set, with its beautifully constructed villa courtyard complete with raised terrazzo and swimming pool, where most of the visual humour takes place, including the clever twist at the end, which takes the audience by surprise. Congratulations to director Barry Mawer for bringing this ambitious technically demanding play to Eastbourne for its New Zealand premiere season. But no critique would be complete without praise for Carol Thompson in costumes and Peter Baldock for his prowess in recreating the clear light conditions of the Mediterranean in an Eastbourne school hall.